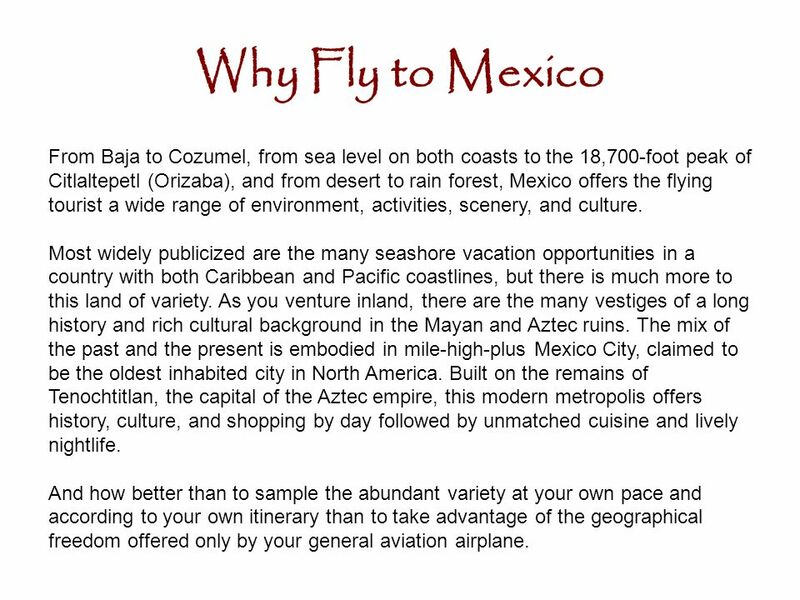 2 Why Fly to Mexico From Baja to Cozumel, from sea level on both coasts to the 18,700-foot peak of Citlaltepetl (Orizaba), and from desert to rain forest, Mexico offers the flying tourist a wide range of environment, activities, scenery, and culture. Most widely publicized are the many seashore vacation opportunities in a country with both Caribbean and Pacific coastlines, but there is much more to this land of variety. As you venture inland, there are the many vestiges of a long history and rich cultural background in the Mayan and Aztec ruins. The mix of the past and the present is embodied in mile-high-plus Mexico City, claimed to be the oldest inhabited city in North America. Built on the remains of Tenochtitlan, the capital of the Aztec empire, this modern metropolis offers history, culture, and shopping by day followed by unmatched cuisine and lively nightlife. And how better than to sample the abundant variety at your own pace and according to your own itinerary than to take advantage of the geographical freedom offered only by your general aviation airplane. 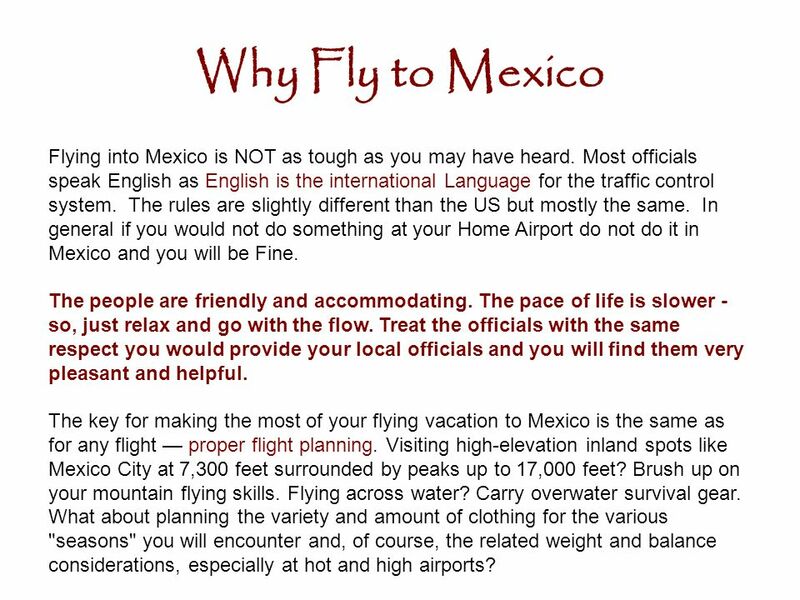 4 Why Fly to Mexico Flying into Mexico is NOT as tough as you may have heard. Most officials speak English as English is the international Language for the traffic control system. The rules are slightly different than the US but mostly the same. In general if you would not do something at your Home Airport do not do it in Mexico and you will be Fine. The people are friendly and accommodating. The pace of life is slower - so, just relax and go with the flow. Treat the officials with the same respect you would provide your local officials and you will find them very pleasant and helpful. The key for making the most of your flying vacation to Mexico is the same as for any flight — proper flight planning. Visiting high-elevation inland spots like Mexico City at 7,300 feet surrounded by peaks up to 17,000 feet? Brush up on your mountain flying skills. Flying across water? Carry overwater survival gear. What about planning the variety and amount of clothing for the various "seasons" you will encounter and, of course, the related weight and balance considerations, especially at hot and high airports? 5 Will I loose my Plane in Mexico? 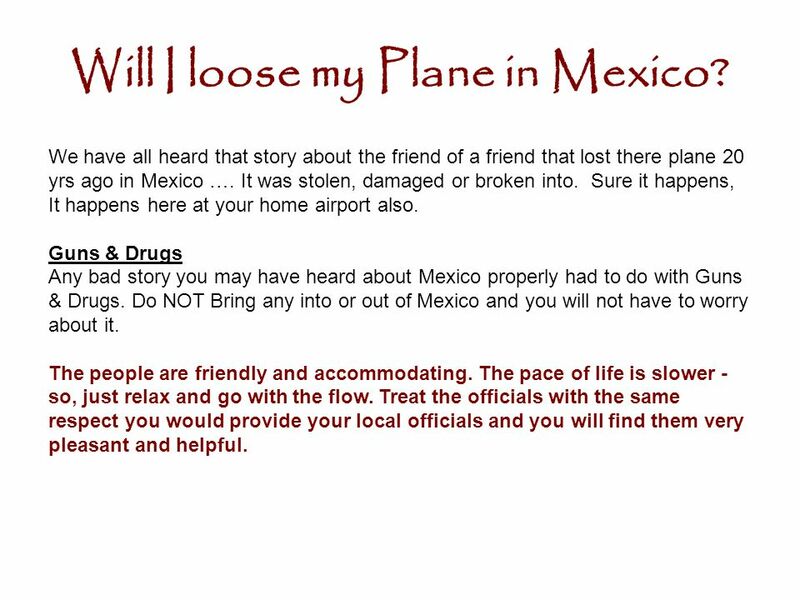 We have all heard that story about the friend of a friend that lost there plane 20 yrs ago in Mexico …. It was stolen, damaged or broken into. Sure it happens, It happens here at your home airport also. Guns & Drugs Any bad story you may have heard about Mexico properly had to do with Guns & Drugs. Do NOT Bring any into or out of Mexico and you will not have to worry about it. The people are friendly and accommodating. The pace of life is slower - so, just relax and go with the flow. Treat the officials with the same respect you would provide your local officials and you will find them very pleasant and helpful. Mexican Insurance You must have an insurance policy issued by a Mexican liability carrier before you travel to Mexico. If you do not have such policy, you might consider using one of the following entities that have been used by our pilots successfully in the past: First check with your insurance provider. A add-on policy is available from most insurance companies. 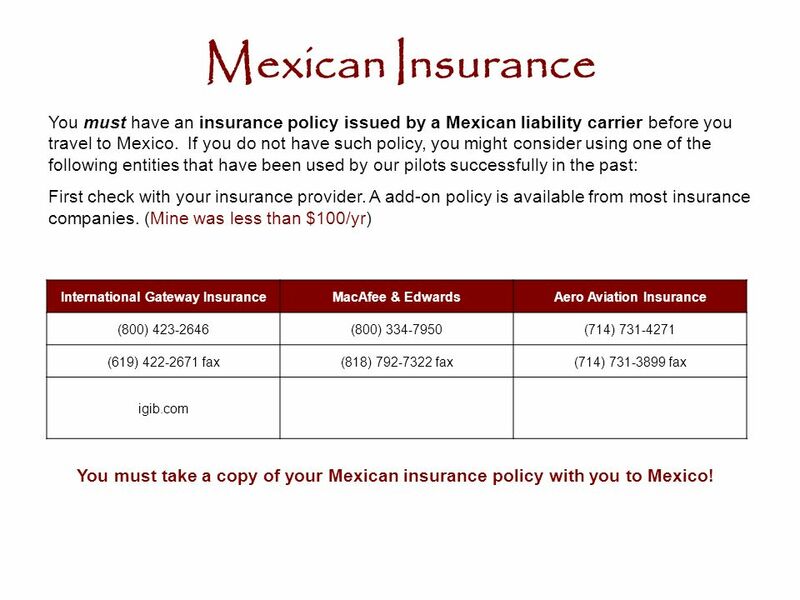 (Mine was less than $100/yr) International Gateway Insurance MacAfee & Edwards Aero Aviation Insurance (800) (800) (714) (619) fax (818) fax (714) fax igib.com You must take a copy of your Mexican insurance policy with you to Mexico! When preparing for your flight to Mexico, one of the first things you will want to obtain is the appropriate aeronautical charts. 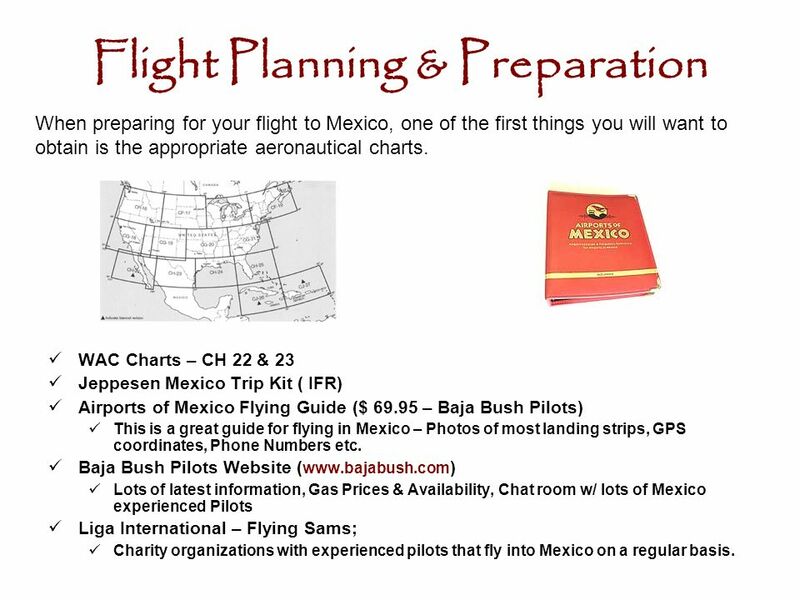 WAC Charts – CH 22 & 23 Jeppesen Mexico Trip Kit ( IFR) Airports of Mexico Flying Guide ($ – Baja Bush Pilots) This is a great guide for flying in Mexico – Photos of most landing strips, GPS coordinates, Phone Numbers etc. 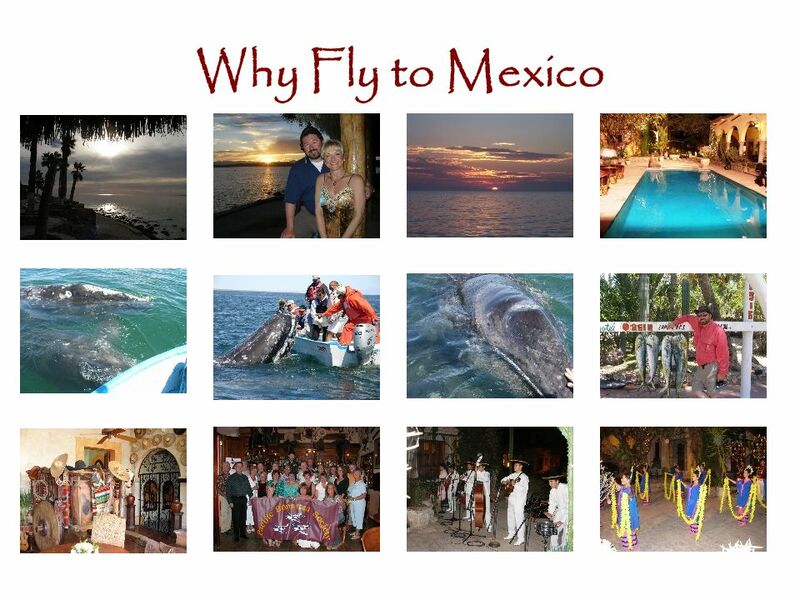 Baja Bush Pilots Website ( Lots of latest information, Gas Prices & Availability, Chat room w/ lots of Mexico experienced Pilots Liga International – Flying Sams; Charity organizations with experienced pilots that fly into Mexico on a regular basis. You will need the CH-22 or Baja Bush Airports Guide to determine your first point of landing in Mexico. It MUST be an International Airport of Entry (AOE). 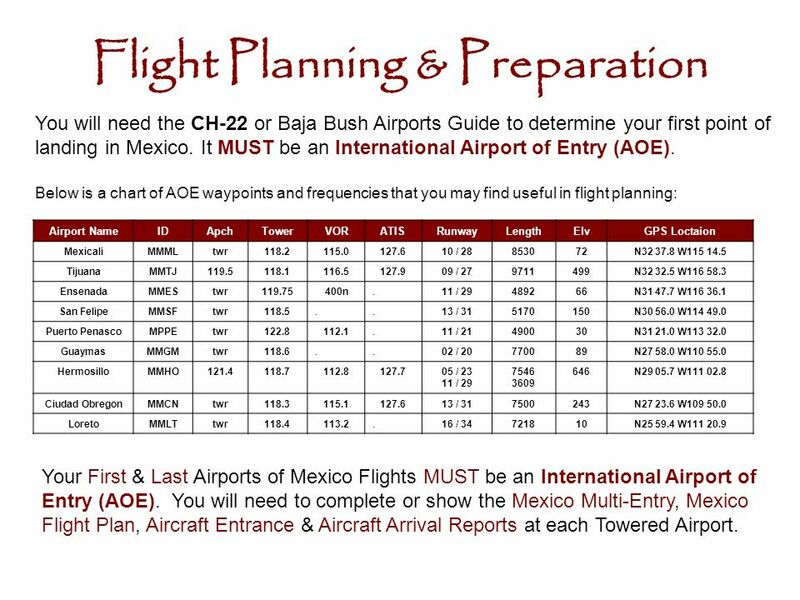 Below is a chart of AOE waypoints and frequencies that you may find useful in flight planning: Airport Name ID Apch Tower VOR ATIS Runway Length Elv GPS Loctaion Mexicali MMML twr 118.2 115.0 127.6 10 / 28 8530 72 N W Tijuana MMTJ 119.5 118.1 116.5 127.9 09 / 27 9711 499 N W Ensenada MMES 119.75 400n . 11 / 29 4892 66 N W San Felipe MMSF 118.5 13 / 31 5170 150 N W Puerto Penasco MPPE 122.8 112.1 11 / 21 4900 30 N W Guaymas MMGM 118.6 02 / 20 7700 89 N W Hermosillo MMHO 121.4 118.7 112.8 127.7 05 / 23 7546 3609 646 N W Ciudad Obregon MMCN 118.3 115.1 7500 243 N W Loreto MMLT 118.4 113.2 16 / 34 7218 10 N W Your First & Last Airports of Mexico Flights MUST be an International Airport of Entry (AOE). 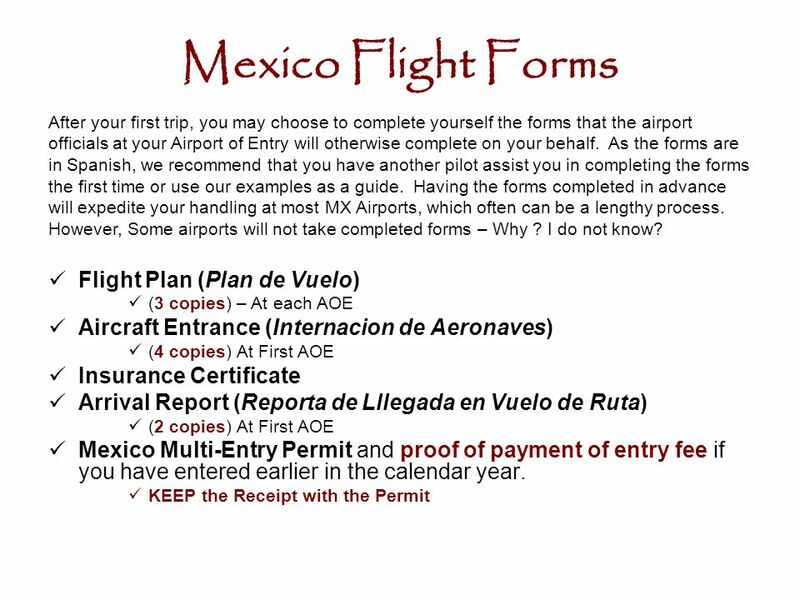 You will need to complete or show the Mexico Multi-Entry, Mexico Flight Plan, Aircraft Entrance & Aircraft Arrival Reports at each Towered Airport. 11 File a USA Flight Plan Call San Diego Flight Service ( ) to file your IFR or DVFR flight plan. We recommend that all pilots either be on an IFR flight plan in U.S. airspace or use VFR flight following. Either way, you need a flight plan to cross the border. San Diego handles hundreds of these each week, and they know the procedure better than other flight service stations. When you complete your flight plan, tell Flight Service that you need a “return customs notification” for the date of your return. 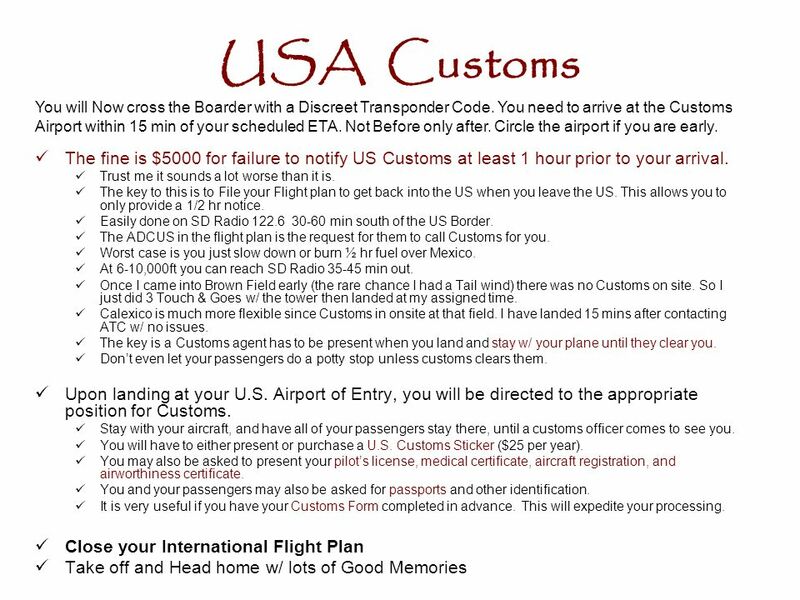 (ADCUS in the remarks) You must indicate the U.S. Airport of Entry to which you will be returning, generally San Diego Brown (KSDM), Calexico (KCXL) or Yuma (KYUM), and the time at which you anticipate you will return. (GA Airport w/ Customs) Flight Service will then notify Customs when to expect you. 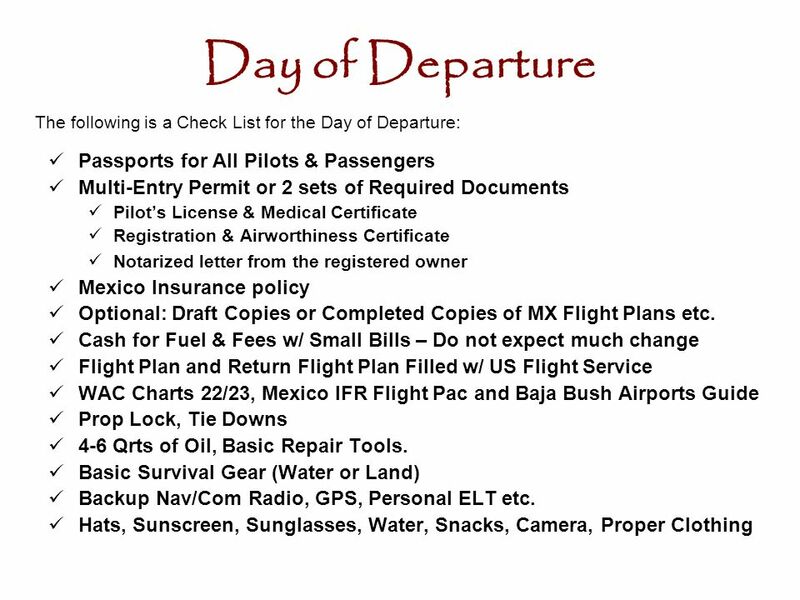 The IFR or DVFR flight plan to Mexico can be filed up to 22 hours in advance of border crossing (the usual flight plan limitation). 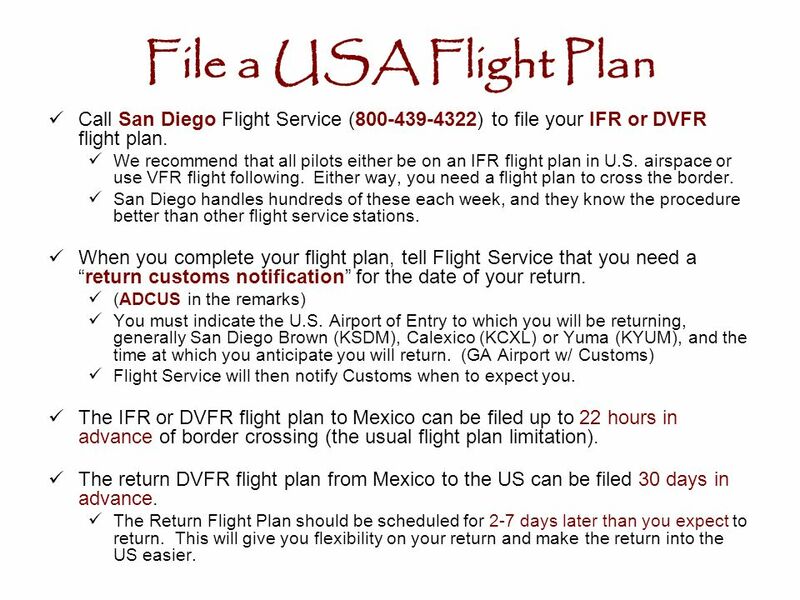 The return DVFR flight plan from Mexico to the US can be filed 30 days in advance. The Return Flight Plan should be scheduled for 2-7 days later than you expect to return. This will give you flexibility on your return and make the return into the US easier. 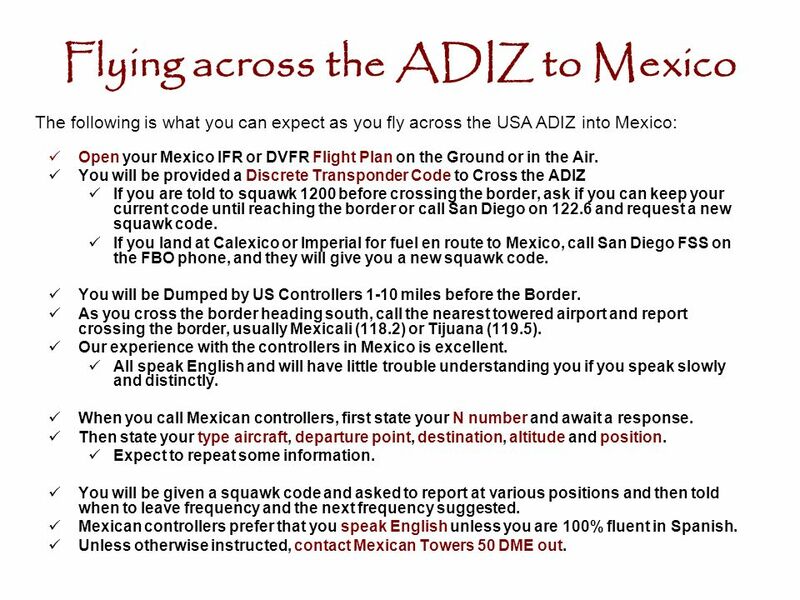 The following is what you can expect as you fly across the USA ADIZ into Mexico: Open your Mexico IFR or DVFR Flight Plan on the Ground or in the Air. You will be provided a Discrete Transponder Code to Cross the ADIZ If you are told to squawk 1200 before crossing the border, ask if you can keep your current code until reaching the border or call San Diego on and request a new squawk code. 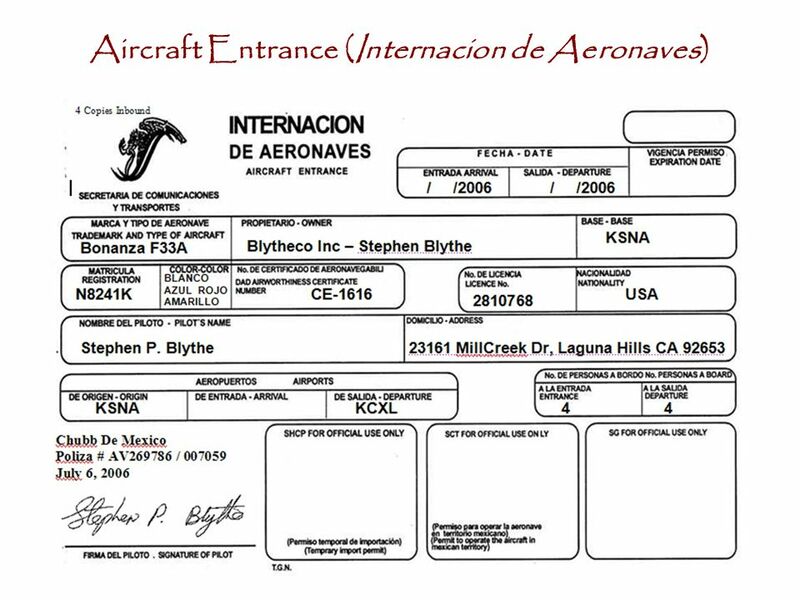 If you land at Calexico or Imperial for fuel en route to Mexico, call San Diego FSS on the FBO phone, and they will give you a new squawk code. You will be Dumped by US Controllers 1-10 miles before the Border. As you cross the border heading south, call the nearest towered airport and report crossing the border, usually Mexicali (118.2) or Tijuana (119.5). Our experience with the controllers in Mexico is excellent. All speak English and will have little trouble understanding you if you speak slowly and distinctly. When you call Mexican controllers, first state your N number and await a response. Then state your type aircraft, departure point, destination, altitude and position. Expect to repeat some information. You will be given a squawk code and asked to report at various positions and then told when to leave frequency and the next frequency suggested. Mexican controllers prefer that you speak English unless you are 100% fluent in Spanish. Unless otherwise instructed, contact Mexican Towers 50 DME out. The flying, communication and landing is the same as it is in the USA. If you did not understand them ask them to repeat. Its the same stuff we hear back home. 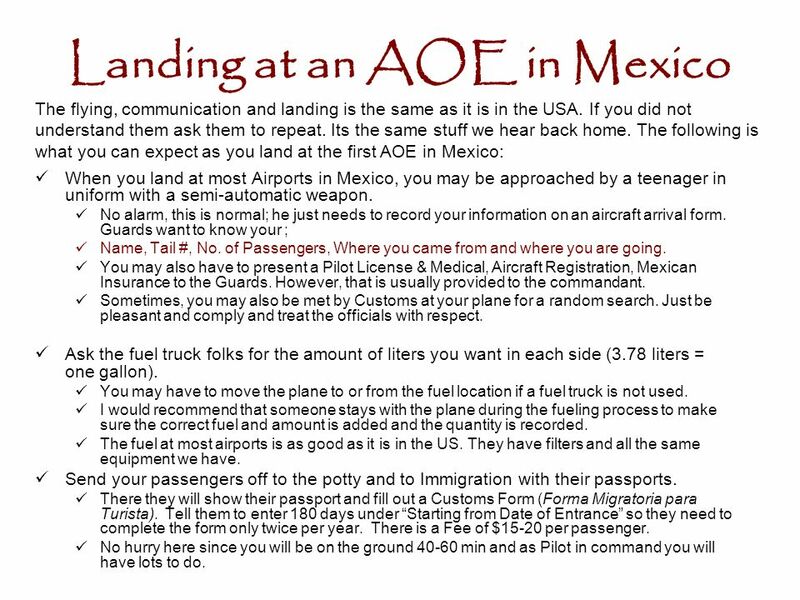 The following is what you can expect as you land at the first AOE in Mexico: When you land at most Airports in Mexico, you may be approached by a teenager in uniform with a semi-automatic weapon. No alarm, this is normal; he just needs to record your information on an aircraft arrival form. Guards want to know your ; Name, Tail #, No. of Passengers, Where you came from and where you are going. You may also have to present a Pilot License & Medical, Aircraft Registration, Mexican Insurance to the Guards. However, that is usually provided to the commandant. Sometimes, you may also be met by Customs at your plane for a random search. Just be pleasant and comply and treat the officials with respect. Ask the fuel truck folks for the amount of liters you want in each side (3.78 liters = one gallon). You may have to move the plane to or from the fuel location if a fuel truck is not used. I would recommend that someone stays with the plane during the fueling process to make sure the correct fuel and amount is added and the quantity is recorded. The fuel at most airports is as good as it is in the US. They have filters and all the same equipment we have. Send your passengers off to the potty and to Immigration with their passports. There they will show their passport and fill out a Customs Form (Forma Migratoria para Turista). Tell them to enter 180 days under “Starting from Date of Entrance” so they need to complete the form only twice per year. There is a Fee of $15-20 per passenger. No hurry here since you will be on the ground min and as Pilot in command you will have lots to do. 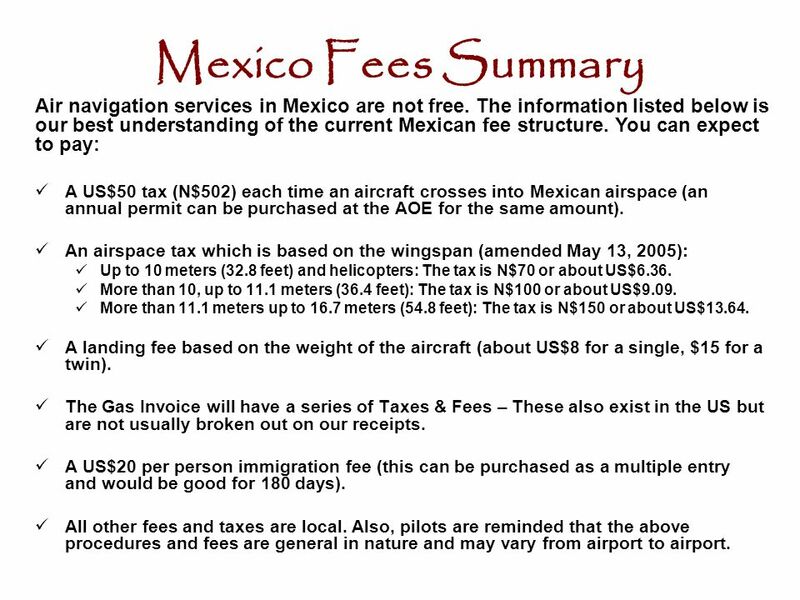 15 Mexico Fees Summary Air navigation services in Mexico are not free. The information listed below is our best understanding of the current Mexican fee structure. You can expect to pay: A US$50 tax (N$502) each time an aircraft crosses into Mexican airspace (an annual permit can be purchased at the AOE for the same amount). An airspace tax which is based on the wingspan (amended May 13, 2005): Up to 10 meters (32.8 feet) and helicopters: The tax is N$70 or about US$6.36. More than 10, up to 11.1 meters (36.4 feet): The tax is N$100 or about US$9.09. More than 11.1 meters up to 16.7 meters (54.8 feet): The tax is N$150 or about US$13.64. A landing fee based on the weight of the aircraft (about US$8 for a single, $15 for a twin). The Gas Invoice will have a series of Taxes & Fees – These also exist in the US but are not usually broken out on our receipts. A US$20 per person immigration fee (this can be purchased as a multiple entry and would be good for 180 days). All other fees and taxes are local. Also, pilots are reminded that the above procedures and fees are general in nature and may vary from airport to airport. 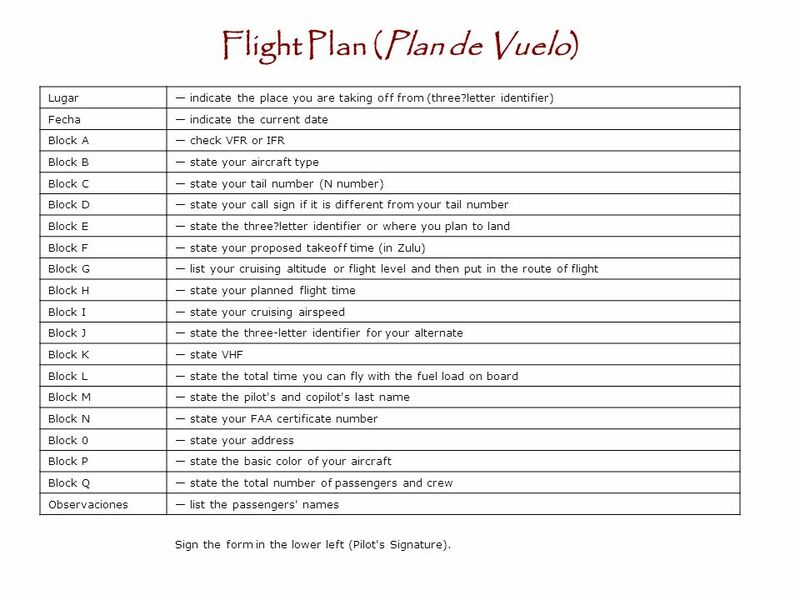 Lugar — indicate the place you are taking off from (three?letter identifier) Fecha — indicate the current date Block A — check VFR or IFR Block B — state your aircraft type Block C — state your tail number (N number) Block D — state your call sign if it is different from your tail number Block E — state the three?letter identifier or where you plan to land Block F — state your proposed takeoff time (in Zulu) Block G — list your cruising altitude or flight level and then put in the route of flight Block H — state your planned flight time Block I — state your cruising airspeed Block J — state the three-letter identifier for your alternate Block K — state VHF Block L — state the total time you can fly with the fuel load on board Block M — state the pilot's and copilot's last name Block N — state your FAA certificate number Block 0 — state your address Block P — state the basic color of your aircraft Block Q — state the total number of passengers and crew Observaciones — list the passengers' names Sign the form in the lower left (Pilot's Signature). 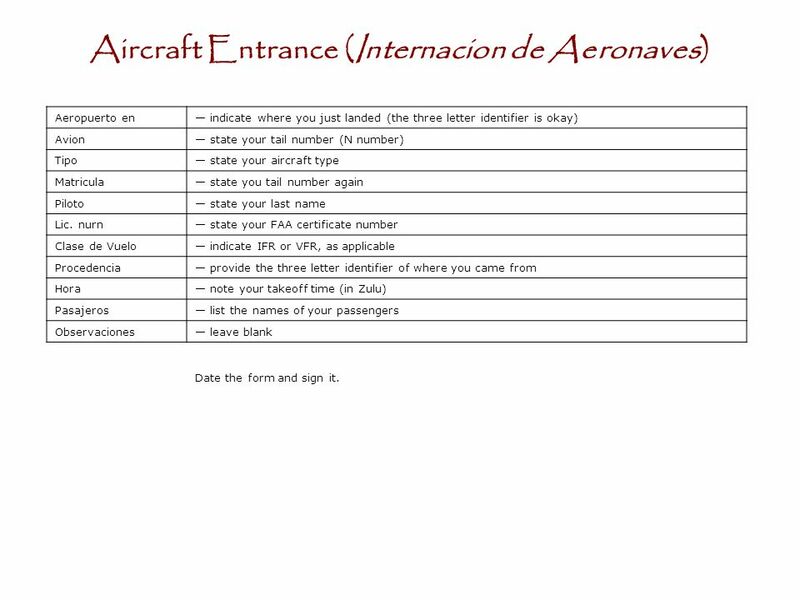 Aeropuerto en — indicate where you just landed (the three letter identifier is okay) Avion — state your tail number (N number) Tipo — state your aircraft type Matricula — state you tail number again Piloto — state your last name Lic. 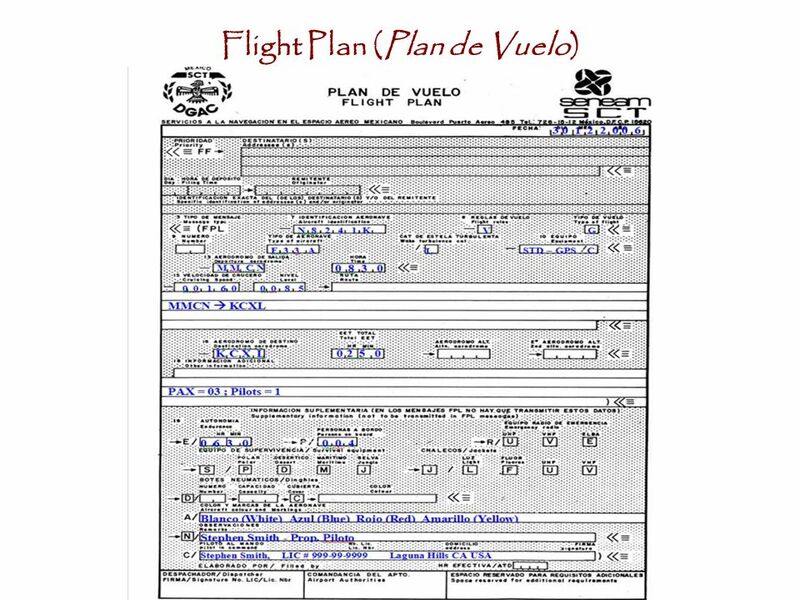 nurn — state your FAA certificate number Clase de Vuelo — indicate IFR or VFR, as applicable Procedencia — provide the three letter identifier of where you came from Hora — note your takeoff time (in Zulu) Pasajeros — list the names of your passengers Observaciones — leave blank Date the form and sign it. 24 Mexico After the AOE Check Fuel, Get back in the Plane and contact the Tower (same as in the US) Take off to your next airport. They will expect you to report heading, Altitude and distance from the airport ( Usually 5, 10 & 30 Miles out. If you did not file a flight plan or the commandant did not send it to the tower, you may be asked to return to the commandants office. Guard your Aircraft Entrance (Internacion de Aeronaves) with your life. 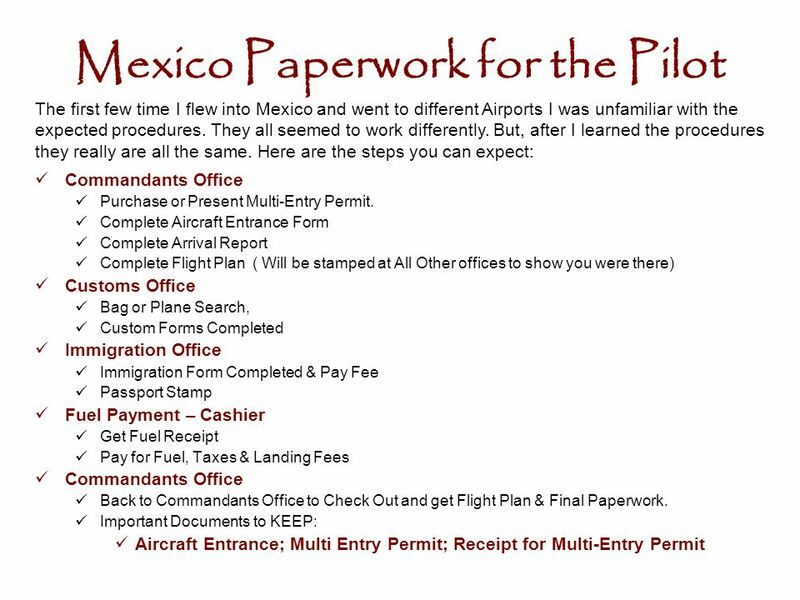 You must show this document every time you land at another airport in Mexico and surrender it at the last airport when leaving Mexico. This is an Important Document. Do Not Lose It. 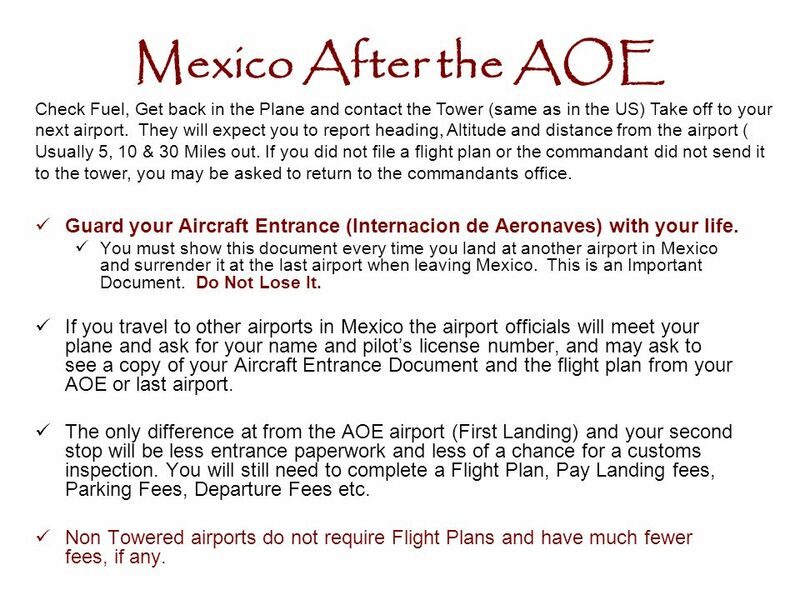 If you travel to other airports in Mexico the airport officials will meet your plane and ask for your name and pilot’s license number, and may ask to see a copy of your Aircraft Entrance Document and the flight plan from your AOE or last airport. The only difference at from the AOE airport (First Landing) and your second stop will be less entrance paperwork and less of a chance for a customs inspection. You will still need to complete a Flight Plan, Pay Landing fees, Parking Fees, Departure Fees etc. Non Towered airports do not require Flight Plans and have much fewer fees, if any. 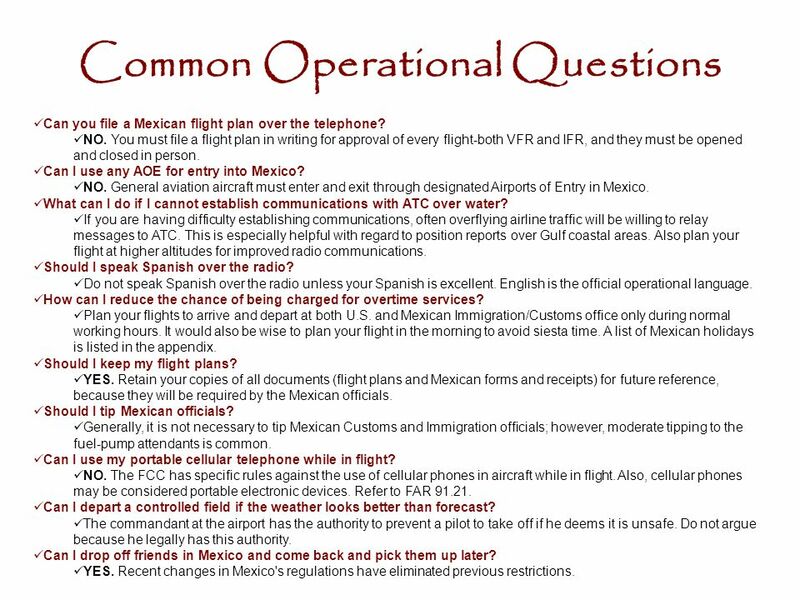 Can you file a Mexican flight plan over the telephone? NO. You must file a flight plan in writing for approval of every flight-both VFR and IFR, and they must be opened and closed in person. Can I use any AOE for entry into Mexico? NO. 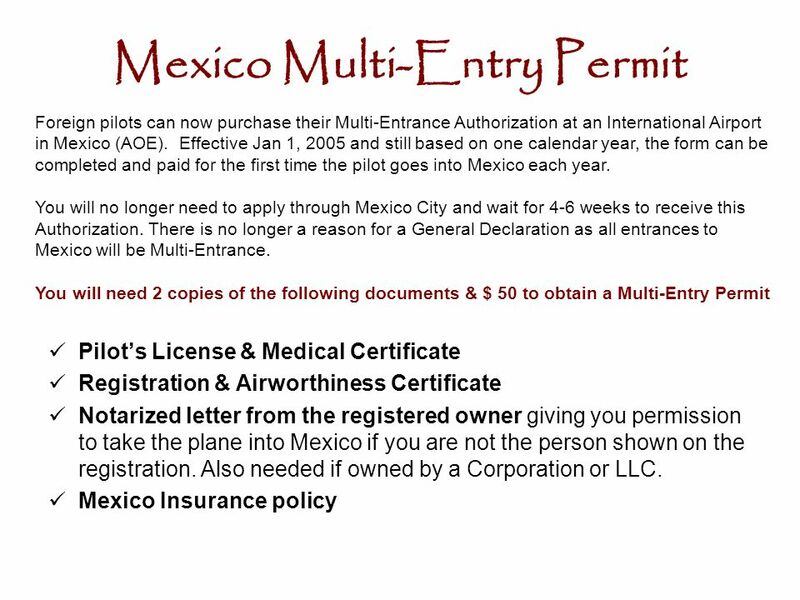 General aviation aircraft must enter and exit through designated Airports of Entry in Mexico. What can I do if I cannot establish communications with ATC over water? If you are having difficulty establishing communications, often overflying airline traffic will be willing to relay messages to ATC. This is especially helpful with regard to position reports over Gulf coastal areas. Also plan your flight at higher altitudes for improved radio communications. Should I speak Spanish over the radio? Do not speak Spanish over the radio unless your Spanish is excellent. English is the official operational language. How can I reduce the chance of being charged for overtime services? Plan your flights to arrive and depart at both U.S. and Mexican Immigration/Customs office only during normal working hours. It would also be wise to plan your flight in the morning to avoid siesta time. A list of Mexican holidays is listed in the appendix. Should I keep my flight plans? YES. 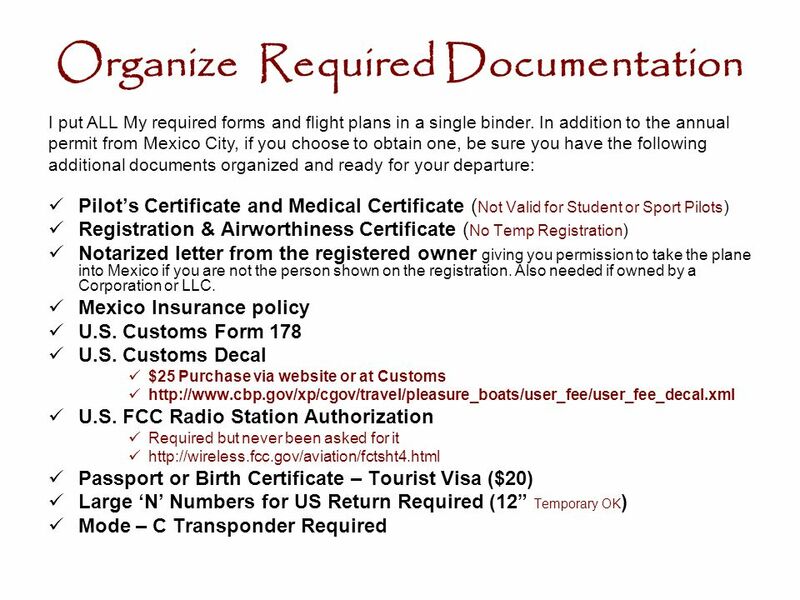 Retain your copies of all documents (flight plans and Mexican forms and receipts) for future reference, because they will be required by the Mexican officials. Should I tip Mexican officials? Generally, it is not necessary to tip Mexican Customs and Immigration officials; however, moderate tipping to the fuel-pump attendants is common. Can I use my portable cellular telephone while in flight? NO. The FCC has specific rules against the use of cellular phones in aircraft while in flight. Also, cellular phones may be considered portable electronic devices. Refer to FAR Can I depart a controlled field if the weather looks better than forecast? The commandant at the airport has the authority to prevent a pilot to take off if he deems it is unsafe. Do not argue because he legally has this authority. Can I drop off friends in Mexico and come back and pick them up later? YES. Recent changes in Mexico's regulations have eliminated previous restrictions. Enjoy Mexico – The further South you go the better the county, culture and the people. Slow Down, Relax, Treat them with Respect, Enjoy the Experience The nicer you are the better there English is !! I joke that I have traveled all over Mexico and Central America and only know 10 Spanish words. Today, I know about 20 and can sometimes put 2-3 of them together. I have never had any communication problems that I would not have had in the USA. Its amazing what some hand gestures and a smile can do for communication. 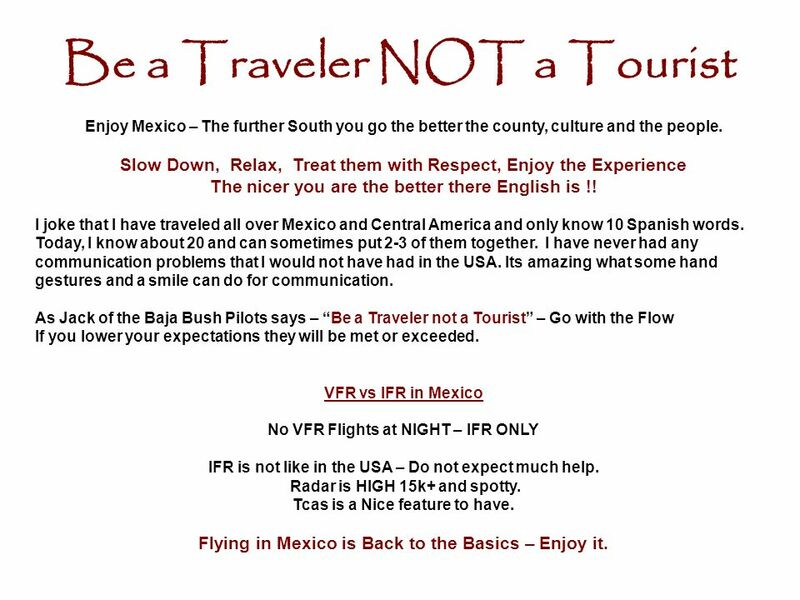 As Jack of the Baja Bush Pilots says – “Be a Traveler not a Tourist” – Go with the Flow If you lower your expectations they will be met or exceeded. 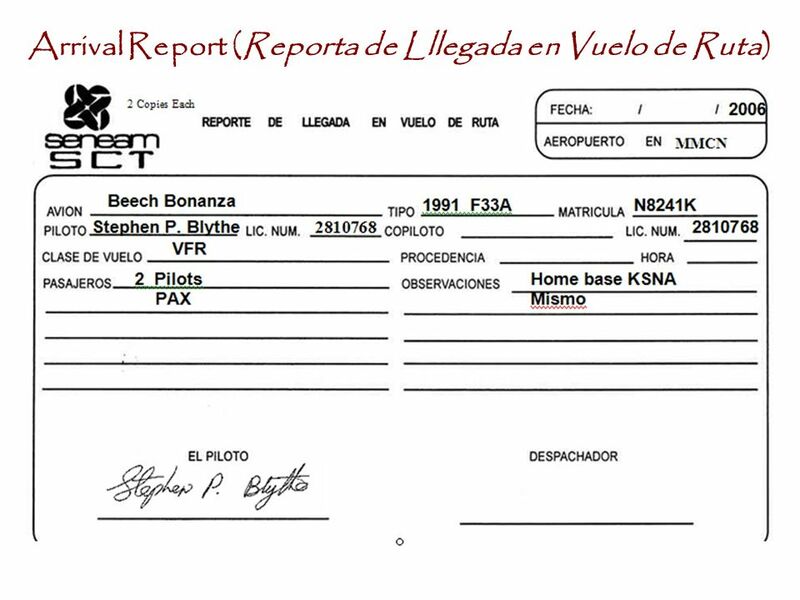 VFR vs IFR in Mexico No VFR Flights at NIGHT – IFR ONLY IFR is not like in the USA – Do not expect much help. Radar is HIGH 15k+ and spotty. Tcas is a Nice feature to have. Flying in Mexico is Back to the Basics – Enjoy it. Now for the HARD Stuff. - Getting Back into the USA. Land at a Mexico AOE before Departure (whether or not you need fuel). Commandants Office There, you will be asked to surrender your Aircraft Entrance document, and You will file an International Flight Plan to your U.S. Airport of Entry. 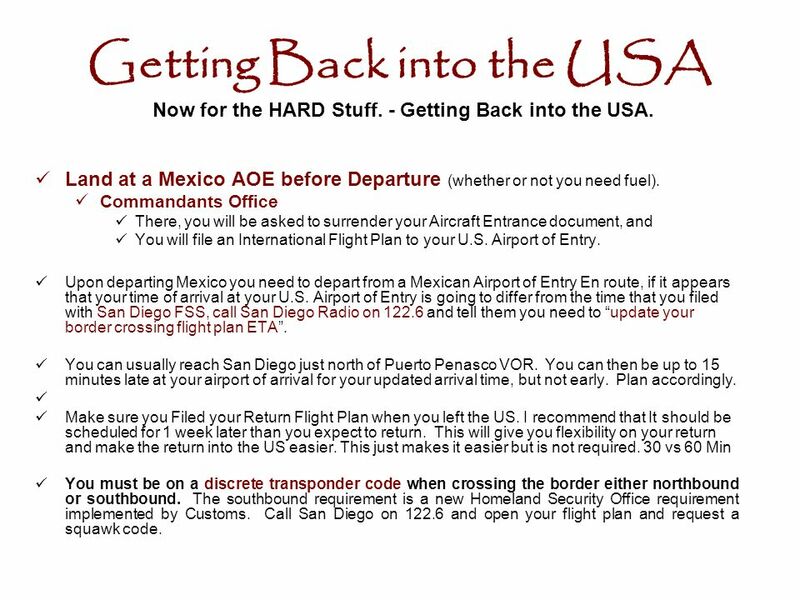 Upon departing Mexico you need to depart from a Mexican Airport of Entry En route, if it appears that your time of arrival at your U.S. Airport of Entry is going to differ from the time that you filed with San Diego FSS, call San Diego Radio on and tell them you need to “update your border crossing flight plan ETA”. You can usually reach San Diego just north of Puerto Penasco VOR. You can then be up to 15 minutes late at your airport of arrival for your updated arrival time, but not early. Plan accordingly. Make sure you Filed your Return Flight Plan when you left the US. I recommend that It should be scheduled for 1 week later than you expect to return. This will give you flexibility on your return and make the return into the US easier. This just makes it easier but is not required. 30 vs 60 Min You must be on a discrete transponder code when crossing the border either northbound or southbound. The southbound requirement is a new Homeland Security Office requirement implemented by Customs. Call San Diego on and open your flight plan and request a squawk code. DO know Customs rules. DO notify Customs in advance by telephone. DO get Customs information from Customs officials. DO be on time. DO request the Customs officer's badge number. DO declare every article acquired abroad and accompanying you, including gifts. DO keep a record of all acquired items; save sales invoices. DO pack your purchases and gifts in one piece of luggage or a box. DO have all your baggage ready for inspection. DO know your state and federal liquor restrictions. DO understand that every country insists upon a Customs examination for returning residents. DO be patient. DON'T exceed your Customs exemption without expecting to pay duty. DON'T forget that your purchases sent home are subject to duty. DON'T be surprised if Customs opens your baggage DON'T forget that all accompanying foreign purchases must be declared, even those you wore or used. DON'T accept the offer of a "false" sales invoice. This could result in seizure or penalties. DON'T rely on the "experienced" traveler or foreign seller for Customs information. DON'T bring back fruits, plants, vegetables, or meat without permits from the U.S. Department of Agriculture. DON'T be late. 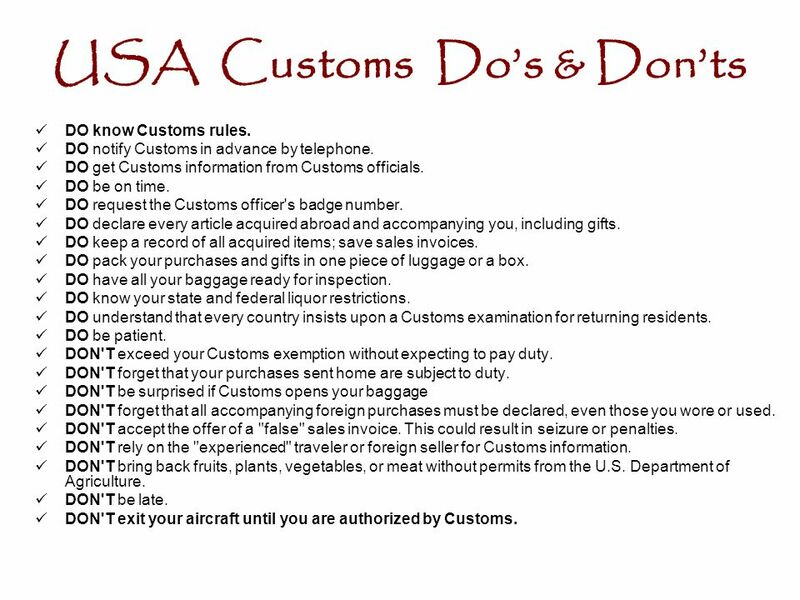 DON'T exit your aircraft until you are authorized by Customs. Enjoy Mexico – The further South you go the better the county, culture and the people. Slow Down, Relax, Treat them with Respect, Enjoy the Experience The nicer you are the better there English is !! 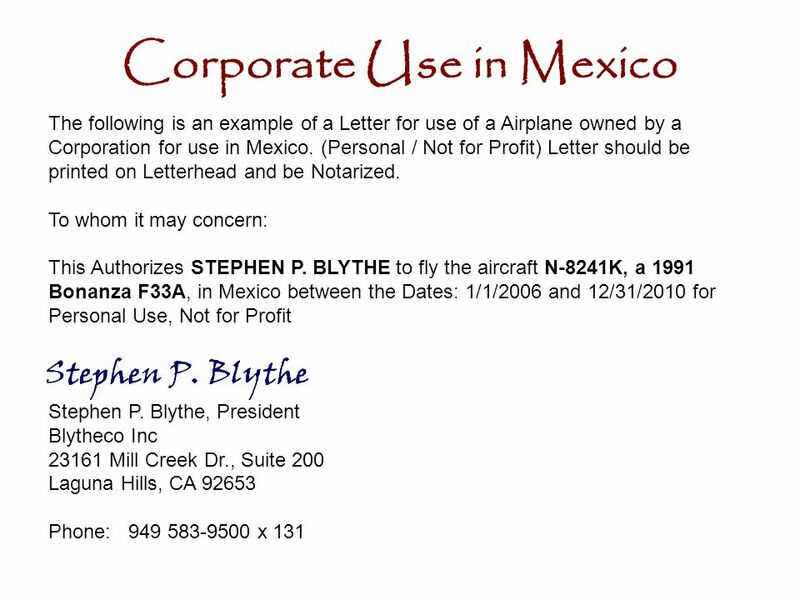 Stephen P. Blythe 23161 Mill Creek Drive Suite 200 Laguna Hills CA 92653 O C Blytheco.com Send me an with your Contact Information and I will send you a copy of this PPT, A more Detailed Word Version and the AOPA Website information on Mexico in a Word Format. 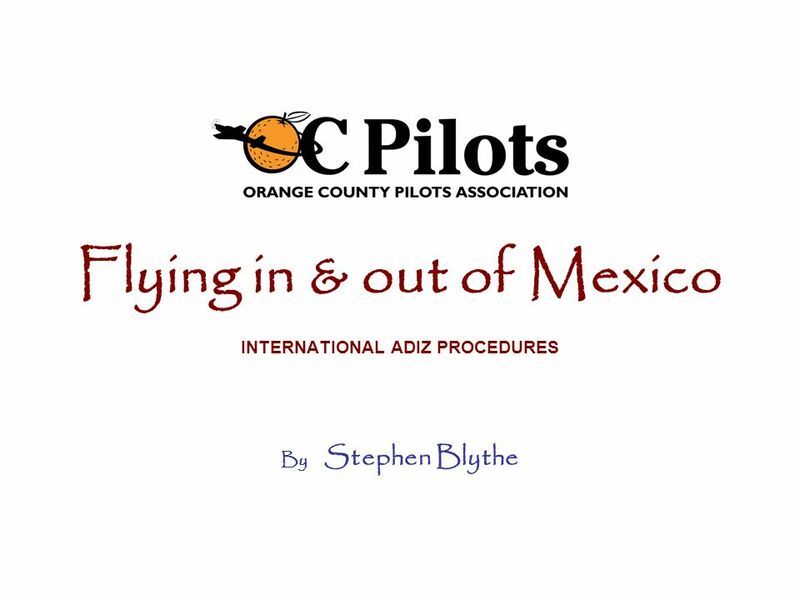 Download ppt "Flying in & out of Mexico"
Presentation Requirements in the Marine Mode – Private Boats. At the Airport made by Zorya I.V..
Communications, Airspace and a bunch of other stuff ! Rick L. Crose Orlando International Tower.